How many ornaments does your tree need per foot? 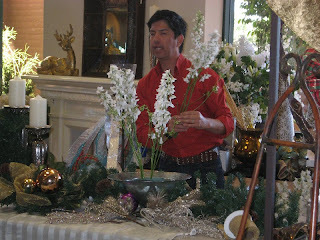 How can you use those big vases in your garage to make a statement on your holiday table? How do you make a perfect bow? These were some of the topics covered in our last two Tinsel Training classes, held at our Bell Rd location. 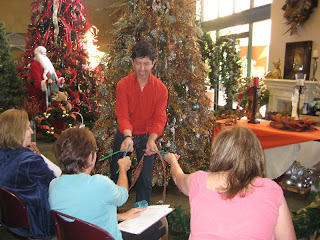 Customers joined us for hands-on training on decorating the tree, mantel, and holiday table, as well as how to spruce up and display wreaths and garlands. Designers Leonard Chavez and Christine Price not only taught basic design principles, but industry secrets on pulling off the designer look in your home this holiday season. We laughed, shared stories, and enjoyed a great discount on holiday decor items in the store. Learn to Decorate Like a Pro this Christmas! Before you bring out the boxes of lights and garland this holiday, come to Tinsel Training for designer tips that will make your home look professionally decorated this season. The first three classes are $20 per person with prepayment, or $25 at the door. The final class is $75 and requires prepayment. Registration is available online, or over the phone at 480-483-9200 ext. 202. You’ll also enjoy a private sale of 35% off EVERYTHING in the store the day of the class. Register today!